SINGAPORE - About 13,000 new jobs will be created in the air and sea transport sectors by 2025, as Singapore continues to expand airport and port operations. Senior Minister of State for Transport Josephine Teo revealed this in Parliament on Wednesday (March 8) during the Budget debate. The two sectors currently contribute around 10 per cent to Singapore's Gross Domestic Product and provide nearly 250,000 jobs. The new jobs will come even as airport and port authorities leverage on technology and push for automation to cope with a manpower shortage. But the nature of the jobs will change, Mrs Teo said, adding: "Innovation and the intensive use of technology will transform the way people work and companies do business". Over the next 10 to 15 years, Changi Airport's Terminal 5 and a new port in Tuas should be operational, with capacity to handle twice the volumes of passenger and container traffic today. The increasing deployment of smart technologies means that new jobs will be more knowledge-intensive. At the port, more data scientists and operations research analysts will be needed to optimise shipping routes, port operations and vessel traffic management. At the airport, Changi will need data scientists skilled in air traffic operations research and analysis, to optimise runway and airspace capacities through modelling and simulation, she said. Technology will also transform existing jobs into higher skill, higher value jobs, Mrs Teo added. To prepare for the future, the Maritime and Port Authority of Singapore (MPA) will set up the MPA Living Lab and work with partners to set up three centres to deepen maritime R&D competencies. 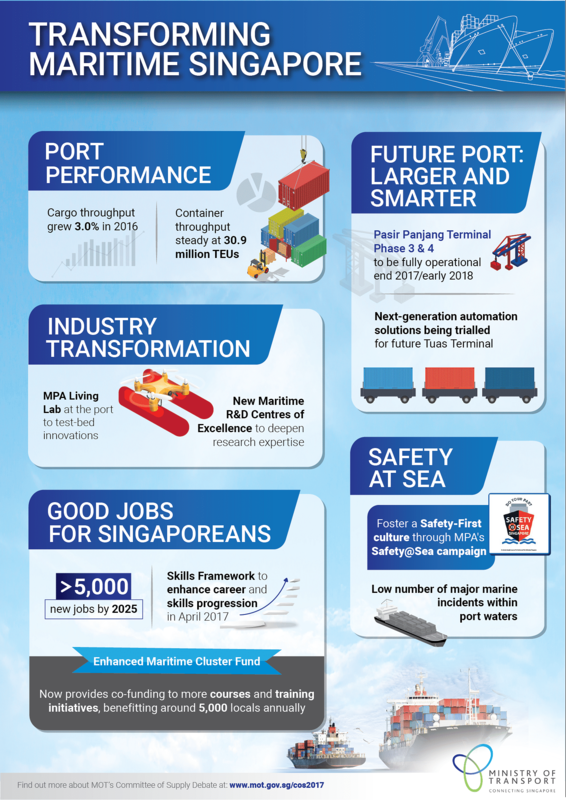 The MPA has also enhanced the Maritime Cluster Fund (MCF) for Manpower Development and the MCF for Productivity, to help Singaporeans upgrade their skills to take on more knowledge-intensive jobs and for maritime companies to adopt technology to improve business processes, respectively. MPA's chief executive Andrew Tan said: "The MPA Living Lab will be the first of its kind in the region and will not only help Singapore to transform its maritime sector into a high technology industry through the test-bedding and development of new systems and capabilities for future port operations but also enable companies to test-bed locally developed solutions under actual operating conditions, bringing these technologies closer to commercialisation and internationalisation." At the airport, the Civil Aviation Authority of Singapore (CAAS) is working closely with industry partners to boost productivity and efficiency on the ground. For example, the deployment of robotics will relieve workers of labour-intensive tasks. Ground handler Sats uses automated guided vehicles to transport food items between food stores and assembly lines. Previously, staff working on the assembly lines had to make multiple trips to the chiller store for replenishments. Now, the same staff can call for supplies to be delivered. This reduces preparation time by almost 40 per cent. To support the airport-wide transformation, workers will have opportunities to upgrade their skills or be retrained to take on new jobs. With intensifying competition in both sectors, Singapore has to keep innovating to stay ahead, said Mrs Teo. "Whether in 10, 20 or 50 years, we still want to be leading aviation and maritime hubs," she said.